Pete is a Professional Underwater Photographer with a long history of working in a variety of situations. It is not uncommon for him to be capturing images in a Florida cave, followed by a deep tri mix dive off the coast of Massachusetts. 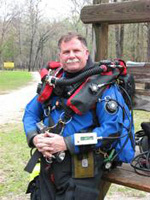 His articles and images can be found in numerous publications and media throughout the world wide dive community. He is a recipient of the BTS Diver of the Year award and the NAUI Outstanding Contribution to Sport Diving Award. He is the National Field Manager for Dive Rite, and is based in Virginia Beach, VA. Diving Equipment has changed dramatically in the last 20 years. The Cave/ technical diving communities have greatly influenced the wreck and sport diver. Pete will take you on a short journey of evolution in regards to equipment, techniques and technology.